The summer seemed long and hot at the time, but now that it's nearly over, the season flew by too fast. The carefree days spent away from the city's steamy thoroughfares - at Coney Island in Brooklyn, Rockaway Beach in Queens, or City Island in the Bronx - have come and gone like waves upon the water. The memory of the lingering pace remains, as well as the long watery vistas with the city skyline moved to the background. View of Johnny's Reef, a popular seafood restaurant on City Island. 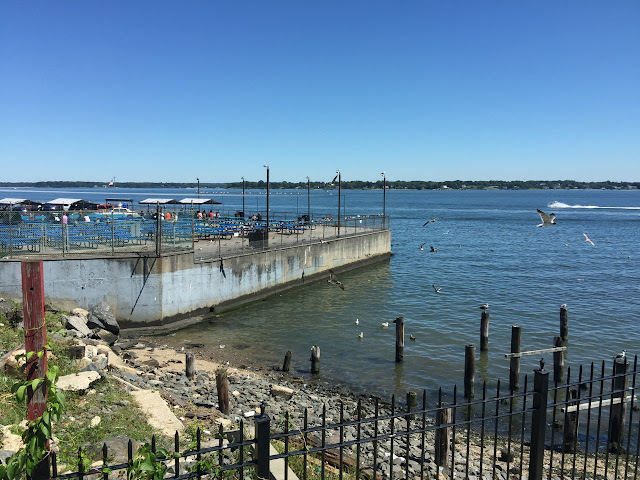 For New Yorkers not altogether ready for the city's busy months, a weekend afternoon on City Island should be added to a repertory of personal escapes. The sight of yachts in the harbor and seagulls diving at scraps of food at the island's many seafood restaurants serve as a necessary break from the mad crowded avenues and the cacophony of jackhammers in the big city. Visiting in autumn would be even better, as the island is normally overrun with traffic on a summer weekend. 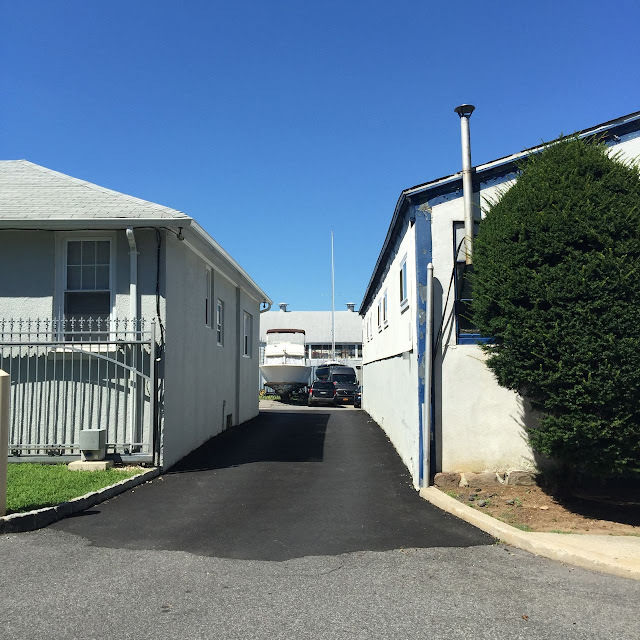 It's not like City Island is any secret. The view from City Island. Manhattan is far away in the distance. Click to enlarge. For those without a car, find your way via mass transit to Pelham Bay Park in the northeast section of the Bronx (the 6 train is the logical choice for anyone coming from downtown) and then the Bx29 City Island bus. 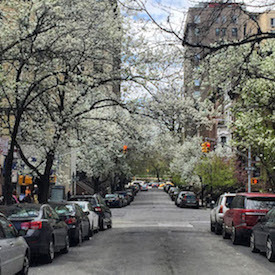 For residents in the lower reaches of Manhattan or Brooklyn, set aside a couple of hours of travel and expect a journey that may well stretch your comfort zone. City Island maintains its historical connection to sailing. The bus to City Island is located within steps of the 6 train's northern end. 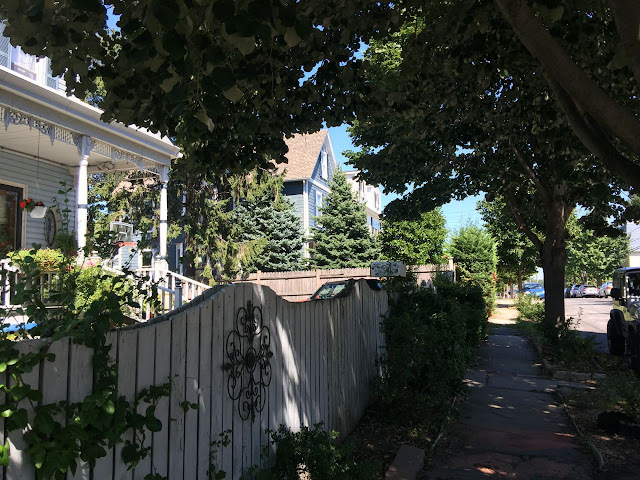 You'll want to take the bus all the way to the end, too, debarking on the southernmost part of City Island on City Island Avenue. The walking journey begins after fried seafood baskets and spirited beverages at Johnny's Reef Restaurant, at prices unheard of in the southernmost sections of Mannahatta. 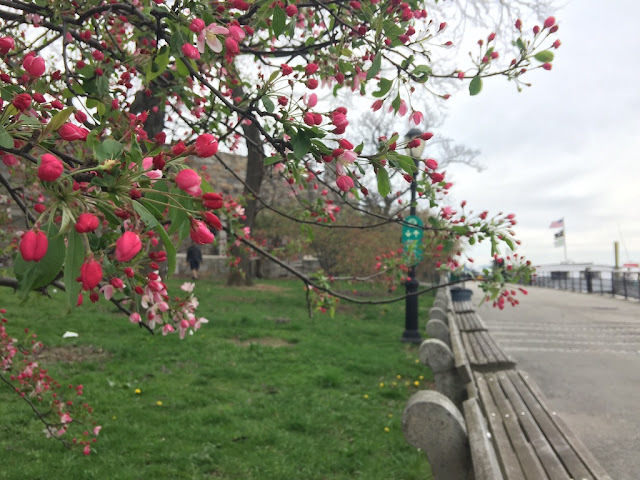 Walk north on City Island and take in the sights. Do not hurry. Many beautiful boats, tucked into marinas, will be on display. 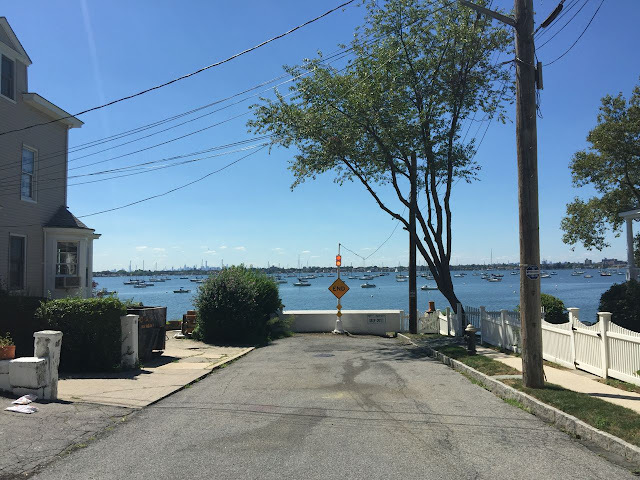 While walking up City Island Avenue, you'll think about sailing lessons and sailing your boat up the Eastern shore. You'll contemplate how to quit your day job and move to City Island with your boat. It's not pretentious here either, so a seafaring dream seems within reach. 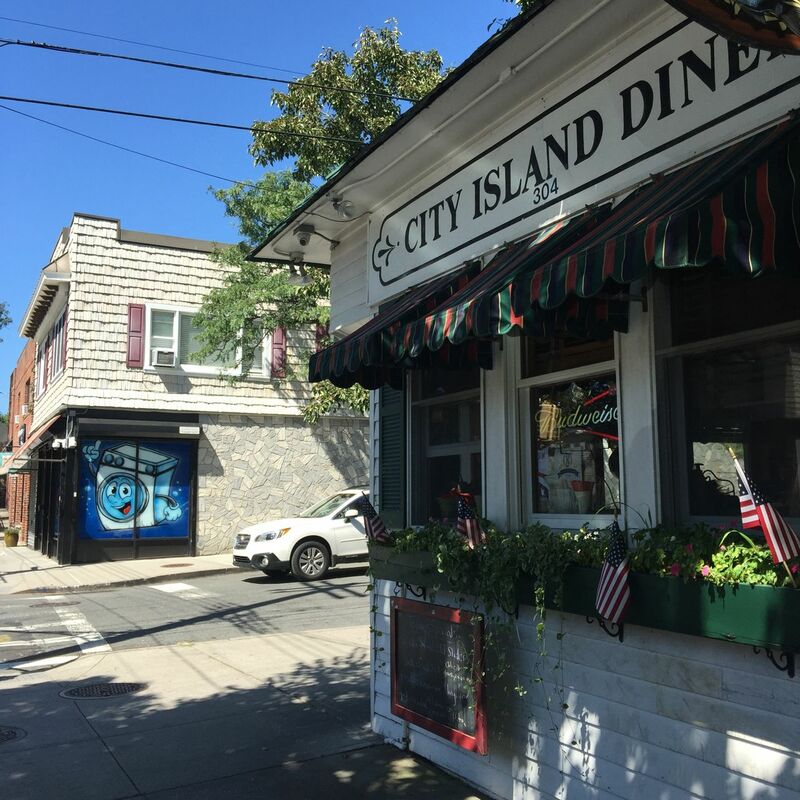 City Island Diner, a favorite for locals. While strolling City Island Avenue, be sure to stop and take in the side streets, too. The view of distant Manhattan from the shores of City Island seems unreal and mythical, something like a mirage. The old bridge to City Island is now being dismantled, including the removal of its welcome sign and the 100-year-old finials. This deconstruction happened last week. When I visited the island in late August, they were still there. Residents won a long fight against a proposed out-of-scale replacement that was out of character for the island. The new bridge will be more modest, even if it doesn't keep people longing for the seas and the slower pace of a different island entirely at bay. The old City Island Bridge in late August, as seen from the Bx29 City Island bus. 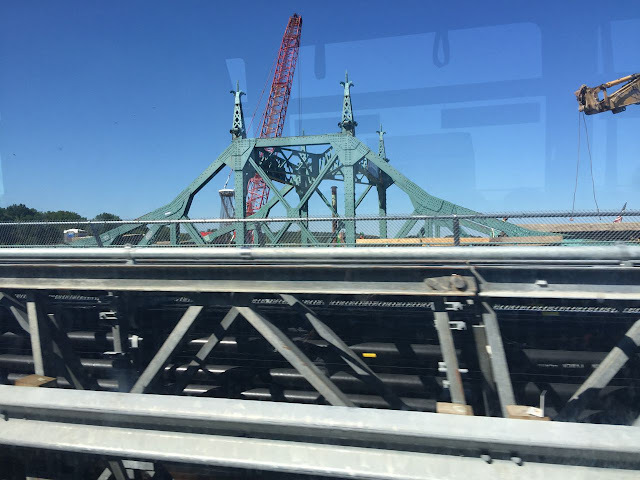 The bridge is currently being dismantled. Images by Walking Off the Big Apple from August 29, 2016.